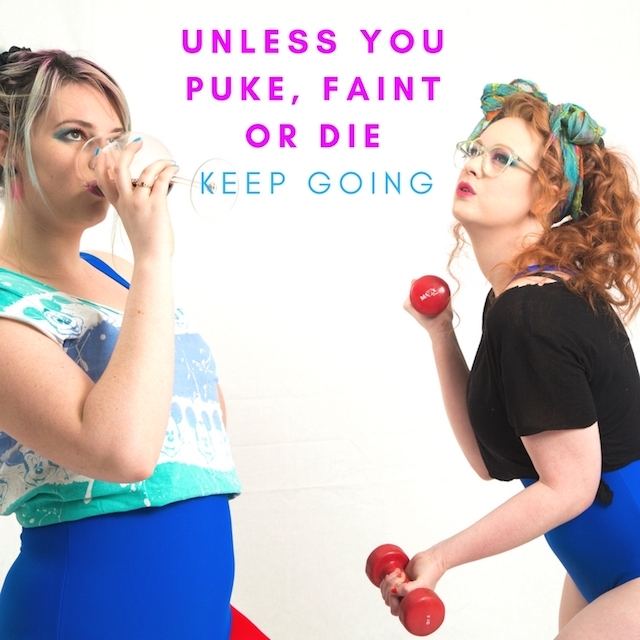 This little article, originally published here; https://adelady.com.au/how-to-survive-the-adelaide-fringe/ was a piece written in the character of Chardee (played by moi! ), along with her buddy Cheryl (the wonderful Mikayla Lynch) who recently performed at the Adelaide Fringe Festival. Fringe has arrived and just like Christmas (but without your weird auntie Sharon getting drunk and taking her teeth out) it’s exciting, confronting, and sometimes a little bit overwhelming. Without a doubt it’s the best time to be in Adelaide; the weather’s great, all your mates are out and there a million and one things to do but it’s always good to grab a little advice – so we got in touch with a couple of ladies who know exactly how to help out. 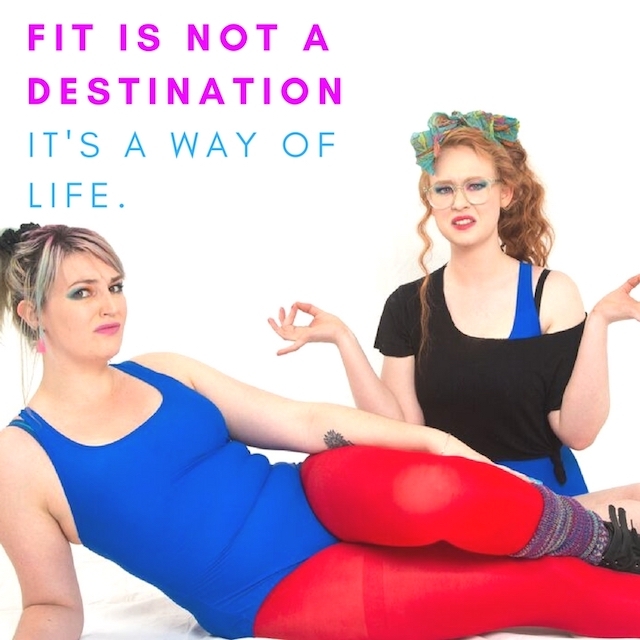 Performing their sassy show, Get Sweatyin the exciting new Rajopolis hub at Raj House, Cheryl and Chardee (alter egos of Adelaide girls Mikayla Lynch and Alicia Norton) are two semi-professional aerobics instructors who are to Fringe what Dolly Doctor was to your teenage woes. We’ve got the questions (that you’re too afraid to ask) and they’ve got the guide…on how to make it through Fringe and come out the other side with your sanity and dignity (mostly) intact. Chardee: I’ve got thighs that do a little bit more than just kiss and combined with the brutal February heat, well all of a sudden it’s like a water slide down there and not in a good way. It’s difficult to get a park in the city and if walking is on the agenda things get a bit…ouchie. My Fringe fashion advice is to always add a sneaky pair of bike shorties under your cute summer dress – because you never know when the dreaded chafe could hit. Cheryl: Be bold, fringe is the perfect time to pull out that sequined cat-suit you own, take that baby out and rock it. I mean what’s holding you back? Chardee: Just like a good love making session, Fringe is a marathon, not a sprint. You’ve got a whole month (and a touch) to survive, so don’t try and pack it all into one weekend – enjoy the entire ride! Cheryl: Take a bloody risk! See that show that caught your eye, worst case it will make for a good story. Chardee: You never know who might offer to buy you a drink at the Fringe bar later that night – be nice to everyone because they could be keeping you hydrated / providing you with dancing juice later in the night! Cheryl: Fringe is the perfect time to make international lifelong friends. Also, a great time to be single, if you know what I mean! Chardee: make a list of shows you REALLY want to see (cough) *ours* (cough) and pre-purchase your tickets to them – you do not want to miss out when everyone else finds out how great we are…but you also need to leave room for those cheeky surprises…. Cheryl: I’m a big planner, but fringe is the one time where you have to loosen that grip on the diary. Don’t forget to pick your kids up from school, but be open to new experiences. Chardee: Your mum would probably tell you otherwise but this is that one time of the year when you can follow a guy dressed as a pirate down a dark alley way and it will probably end well…probably. Cheryl: What have you got to lose? Chardee: I promise that you can’t go out and get Fringe-y every night. We’re trained professionals, at the peak of our profession (well okay, we’re semi-professional and we get puffed out pretty easily) and even we need a break sometimes. It’s okay to say no, the Winter Olympics is on the telly and some of those athletes are pretty easy on the eye…plus you can’t sit on the couch without pants and a bra in The Garden of Unearthly delights…and sometimes we all just need some bra-free time. Cheryl: pace yourself babe, no one wants to be the person that misses the party because they hit the pre-drinks too hard. It’s the same with Fringe. Manage that energy. Keep yourself safe. Chardee: it’s easy to forget about vegetables that aren’t fast, fried and made of potato…make some time, room and effort and get an apple in your chops. It’ll boost your immune system, keep you regular and help you look as hot in leotards as Cheryl and I do. Cheryl: Look, I take impeccable care of my machine, but it’s a temptation to eat burritos every night. Pre-make some meals, pop em in the fridge. Take care of yourself. Chardee: If there’s one question that people always ask me without a doubt its “Chardee, how do you stay so hot?” and while it’s not really a simple answer, I need to make people satisfied so I tell them that sleep is just so bloody important – and it’s not a straight up lie. You’ll need to make sure you get some solid sleep to make it through Fringe alive! Cheryl: I am big fan of a nap, you can make time to close those peepers. Chardee: No matter how ridiculously you dance, there’s always going to be someone at Fringe going harder and crazier who’s far less inhibited – so let you’re freak flag fly and combine exercise with fun on the d-floor and if you’re stuck for moves then grab a ticket to our show! Cheryl: Here’s the thing, YOU CAN DANCE. Even if your repertoire is Kate Bush moves, rock those. I am all about a good boogie and if you are too come join us!